A Cape Town woman from Du Noon township heroically risked her life to rescue a pensioner from a blazing shack on Saturday night. Sindiswa Silulu, 31, who stays in Du Noon’s Siyahlala informal settlement saw 61-year-old Zamile Kubashe’s shack becoming rapidly engulfed in flames. Suspecting he was inside, the diminutive woman kicked down the door and pulled Kubashe to safety. The drama occurred shortly after 9pm, and Kubashe was asleep at the time. His face and hands were burnt and he had inhaled smoke. City’s fire and rescue services who arrived at the scene shortly after Kubashe was rescued, rushed him to Somerset hospital where he was treated. He was discharged on Sunday morning. Although two other shacks were also destroyed, there were no other injuries reported. Resident Mercy Makuba said Silulu’s selfless act was heroic. “She (Silulu) is a hero. She has her own shack and a disabled child who can’t talk but she ran and saved madala (Kubashe). She didn’t mind about herself,” said Makuba. Speaking on Sunday, Silulu, who has three children in all, said the fire was likely caused by an illegal electricity connection. She said she was awakened by the smell of burning plastic and looked out to see Kubashe’s shack across the lane from hers, burning. “I felt sad and panicked. I knew that tata omkhulu(the old man) was there,” she said. Kubashe’s shack was also attached to a shebeen which he operated with three other business partners. While the fire, which burnt two other shacks, was being fought, his business partners tried to salvage the liquor from the shebeen. While they put crates and bottles down outside, thieves stole them. Some residents were seen drinking the beer early morning on Sunday. 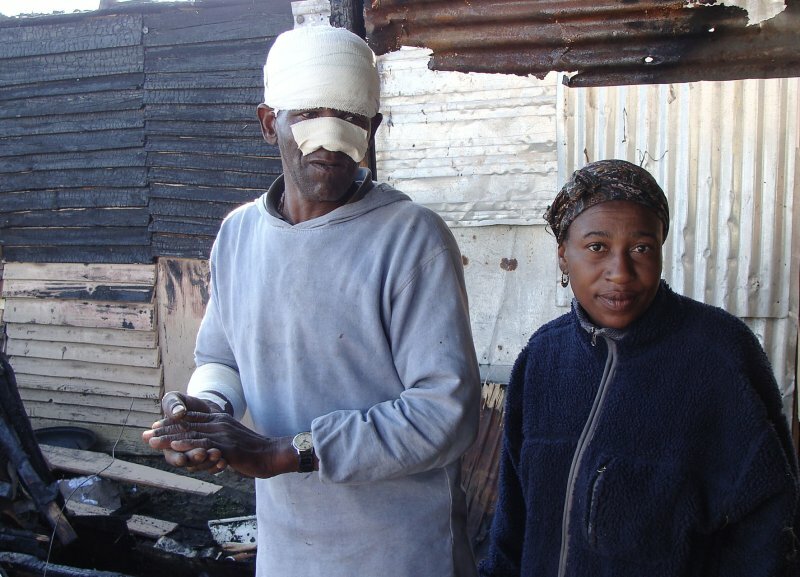 Kubashe, with his head, nose and right hand covered in bandages on Sunday night, said although he had lost everything in the fire, including his bank cards, ID and R1,500 cash, he was happy to be alive. However, he said it was painful to realize residents, who were pretending to help salvage his stock and put out the flames, stole off with R2,500 of liquor. “People trying to help were stealing our stock, about 17 cases of beer were stolen,” said business partner David Delihlazo. Community Leader Elizabeth Makonjo, 38, said residents used their own stores of water to fight the blaze, but when that ran out they had to run 50 metres to fetch water from a communal tap. Makonjo said neighbouring residents frantically demolished their adjoining shacks to prevent the fire from spreading. She said it was a matter of concern that a lack of service delivery in the informal settlement meant residents had to illegally tap off the electricity grid from nearby RPD houses, heightening the risk of fires which had to be fought from water supplied by communal taps. Those who didn’t tap electricity illegally had to rely on paraffin stoves for cooking and heating, themselves fire risks. “We need the city to provide us with our own electricity, toilets and enough water taps, we need our welfare to be taken to heart,” she said. City’s Fire and Rescue Services control centre station commander Theo Layne said they received a distress call at 21:13 on Saturday night and they reached Siyahlala informal settlement three minutes later. He said Kubashe sustained second degree burns.